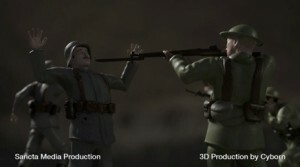 Motion capture studio Cyborn developed a one-minute short animation video with motion capture in memory of World War I. This is one of the 12 short videos which were supported by VAF and which played in Kinepolis for several months. You can also find the short video online. These short movies may only seem like a small thing, but they are important to stimulate awareness amongst today’s youth, to remember the past. Another cool project handled by Cyborn was the CD&V 3D animation of politician Kris Peeters, making it possible for individual people to meet a 3D version of Kris Peeters on their tablet or smartphone. This required a mixture of motion capture technique and augmented reality.